Batam’s Turi Beach is nestled in Nongsa Resorts–at the northeast part of Batam Island–and 35 minutes away from Singapore by ferry and 15 minutes from Hang Nadim Airport. Set amid 7.7 hectares of beautiful green landscaping in a tranquil tropical village, Turi Beach features modern-minimalist accommodation in Tirta and Riani Wing. All 140 deluxe rooms and suites are facing the sea, being well spread over the beach front and the hillside. The newly rejuvenated Riani Wing encompasses a collection of contemporary wooden design timber cottages with private balcony and daybed scattered across a generous parcel of natural landscape that descends down to meet the sea. The suites have a separate bedroom and living environment plus a lavish Jacuzzi for a spa-inspired bathing experience. The wing is blessed with inspiring views of the ocean and tropical greenery that cocoons the entire resort. Meandering pathways connect each different tier and provide easy access to the beach. 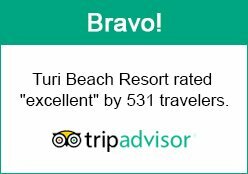 Turi Beach Resort is your idyllic retreat in the tropical Riau Islands amidst unspoilt beauty and fine beaches where tranquillity and impeccable service are rightly yours to savour.